Design bloggers Monica and Jess take on two homes with two completely different looks -- one modern and one rustic -- as they help the neighbors prepare for the holiday. Neighbors Becky and Kristin love the holiday season and use their homes to entertain quite often this time of year. They both want to makeover a room in their house, but they have completely different styles. Becky wants to decorate her family room in a rustic holiday theme, while Kristin wants to try something modern in her dining room. Their budget? $150 to 200 each. Each woman sent in inspiration photos, but the ideas there could cost anywhere from $500 to $1000. Can Monica and Jess come up with a plan to DIY it for less? To tackle two rooms, Monica and Jess split up - Monica going with Kristin to create a modern holiday dining room and Jess staying with Becky to create a rustic Christmas scene in her living room. To get started, Jess gets the power tools out and shows Becky how to take an old piece of reclaimed wood and turn it into a mantel that can be used for decorating all year round. They start by taking apart some old scaffolding saved for Monica and Jess by a carpenter friend. Then they cut it to create a box for the mantel and put it together with a nail gun. Meanwhile, Monica shows Kristin a fun way to drastically change the look of her dining room that isn't permanent. Monica wants to change up the dining room walls but wallpaper can costs hundreds of dollars per roll. Instead, Monica finds inexpensive bold fabric, measures and cuts it up and shows Kristin how to put it on the walls using liquid starch. By using liquid starch to attach the fabric to the wall, you are creating a temporary bond that can easily be taken down. You can leave it up year round or if you decide you only want it for the holiday season, just take down the fabric and use soap and water to wash the walls. Next up, Jess gets to work on a simple and easy DIY project for Becky's front porch. Using a wood palette that Becky already had in her garage along with the leftover wood from the mantle, Jess shows Becky how to build a primitive rustic tree to display. First, they take the wood pieces and cut them in different lengths. After they have been cut, they use woodblocks to paint them in order to create a rustic look. By taking the colored pieces and attaching them on a stake going from largest to smallest, we create a tree that not only has a nice weathered look to it, but is the perfect statement piece for the front porch. The next project involves creating decorative clipboards that display photos or artwork that you can place on the walls. To create them, Monica and Jess take a 12 foot plank and cut it into segments. After sanding each segment so that it has smooth edges, they show Becky and Kristin different ways to decorate the wood that will fit the theme of their room. Jess uses a walnut stain on Becky's clipboard for a very rustic look, while Monica utilizes a glossy red spray that gives the room a pop of color. After the wood has been painted, they attach a binder clip so they can be used to hang artwork. Monica really wanted to create the perfect classy wreath for Kristin's front porch. While shopping around, she saw so many ones that she liked but they came with a hefty price tag. By using material found in Kristin's basement and her creativity, Monica has come up with the perfect idea to create a stylish and modern wreath using PVC pipe she found in Kristin's basement. First, they take the PVC pipes and cut them into one to two inch slices. Although the project starts creating a little bit of a mess outside, the white particles created by cutting the PVC make it feel like it's snowing outside. After Monica creates some PVC snow angels to get her in the spirit, she shows Kristen how to glue the PVC pieces together in a circle to create a modern wreath. Everyone loves decorating the tree! Although it'd be great to change up your ornaments every year to match your style, buying new ones can be extremely costly. Monica and Jess provide some fun and easy ways to switch up your ornaments this year without spending a fortune. For a more rustic look, Jess suggests cutting up some fruit and dehydrating it in the oven. Once it is dry, add a hook and you instantly have fresh and festive ornaments to add to your rustic tree. She also suggests purchasing Styrofoam balls and decorating them yourself to save money! Not only are the Styrofoam balls cheap, but you can use hemp, twine, or colored ribbon of your choice to glue and wrap around the ball. You will instantly have a textured ornament that will add a great rustic flair to your tree. To create some modern and stylish ornaments, Monica suggests buying some clear glass ornaments to decorate. One cool way to create an ornament that's super easy is to take some paint, squeeze some into the glass ball and swirl it around. It creates a fun look that adds a splash of color to any tree. Another fun way to dress up the tree is to take some old CD's lying around the house, break them up into small pieces and glue them onto the clear glass balls. What your left with is a super stylish ornament that shines brightly on your tree. At the beginning of day two, there is still a lot of work to be done. But there's been a huge surprise last night - Jess' baby, Bennett, was born four weeks early! After using Facetime to talk to Jess at the hospital, Monica is now more determined than ever to finish both rooms on time so that she can go visit baby Bennett. A big part of decorating a dining room involves the actual d�cor on the table. Sophisticated and festive centerpieces for the table can cost hundreds of dollars! But Monica shows Kristin a few ways to spice up her table DIY style. First, Monica takes fence posts that she bought on sale and cuts them into different sized rectangular pieces, drilling holes in them to make them into chunk modern candleholders. After that, Monica shows Kristin how to take a traditional holiday decoration such as an ornament ball, and transform it into fun placeholders. She takes black colored ornaments and uses a white paint pen to write some holiday related words around it and tops it with a sticky note with each person's name. Finally, to add some bold black and white color to the table, Monica takes some polka dot wrapping paper and cuts it into a fun arrow like shape for a base. Once the base is created, she uses a radiator cover she found to place on top and you have the perfect set up to add your decorative pieces. With time running out and both rooms to finish, Monica kicks it into overdrive and adds the finishing touches to each room that will give Becky her warm and rustic family room and Kristen her bold and sleek modern dining room. The designs in these houses could not be any more different and Monica doesn't even know if they'll even recognize their new spaces! First up, it's time for Kristin to see her new stylish and modern dining room. With the simple color scheme, statement pieces and bold patterns scattered throughout the room, the room has been transformed into one that's chic and modern. A lot of the pieces used in Kristin's dining room were random things Monica found around the house! Monica even found a reindeer that Kristin had laying around that she spray painted white and mounted to the wall. Between the bold new wallpapering, DIY tablescape and reusing a lot of items Kristin already had around the house, the total for everything including the porch was only $147.50. That's over $50 under budget! 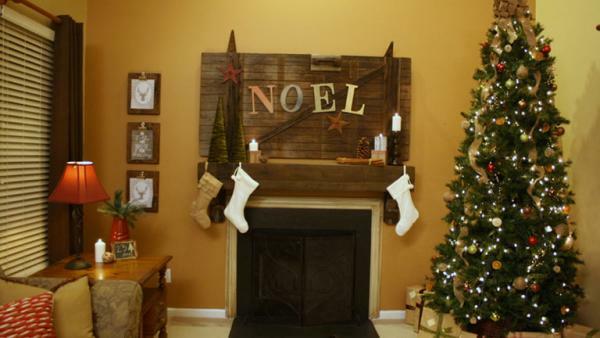 And finally, it's time to reveal Becky's new rustic holiday themed family room. From the classic mantel that Jess and Becky built together to the rustic ornaments that adorn the tree, the room has become a cozy and warm room for all of the family to gather in. Above the mantel is an old door that Monica and Jess decorated to reflect the holidays. For all of the accessories, DIY projects and the front porch, Jess only spent $149. Two rooms under budget? That's a gift that Monica and Jess always love giving! Friends Becky and Kristin want to makeover a room in each of their homes in a fun holiday style. With a budget of $150 to $200 per room, plus a plan to decorate their front porches, can Monica and Jess pull off these spirited projects? Love the rustic look for your holiday decorations? Here's how you can create a beautiful rustic mantel from reclaimed wood, like an old door that you can decorate for Christmas or any time of year. If you want to transform a room, but can't afford the high price of wallpaper, try fabric. A bold fabric like this black and white stripe can make a modern statement that instantly updates this room's style. Take an old pallet and easily transform it into a beautiful holiday tree for your porch or front yard. Learn how to do this easy DIY project. Those beautiful holiday wreaths can cost a pretty penny. Here's how you can make your own modern take on a wreath with just a few lengths of PVC pipe. Want a beautiful, modern holiday table for way less than it would cost at a regular store? We'll show you how to DIY this gorgeous black and white holiday tablescape for $25 total with these easy projects like chunky wood candleholders, wrapping paper table runners and placeholders made from tree ornaments. Get step-by-step directions and see detailed photos for projects from our holiday double-room makeover. See how Monica and Jess transformed two friends' rooms into completely different holiday styles.